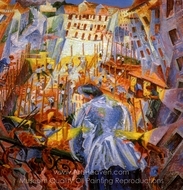 Unlike many other art movements of the late 19th and early 20th centuries, Futurism did not originate in France, but in Italy. The movement was founded in 1909 by the writer Marinetti, first as a literary philosophy and later attracting visual artists such as Severini, Carra and Boccioni. And just like other art movements, Futurism themes were soon found in other mediums - movies, books interior design and even fashion. Manifestos - or statements outlining the beliefs and values - were written and published on everything from painting to fashion. The name rather aptly sums up the movement�s beliefs and ideals. Futurist painters were not interested in the established - and to their minds, dull - guidelines and conventions that had gone before. 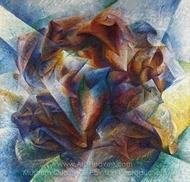 Rather like Cubism, which was popular around the same time, Futurism deliberately rejected the tried and tested painting techniques that had gone before. Its aim was to depict the future - or at least the excitement and innovation and feeling of change that characterized the early decades of the 20th century. The early 20th century was a time of great advances in industry and architecture; as well as the birth of the car and airplane. The Futurists liked speed, noise and machines and Futurist paintings are full of scenes that depicted modern life - cityscapes, often with a futuristic or science fiction appearance, trains, workers toiling away in factories and machinery. 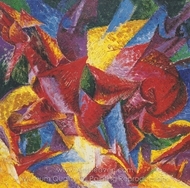 Many paintings attempted to depict objects in motion or capture a feeling of speed or constant change; a good example is Balla�s painting entitled �Dynamism of a Dog on a Leash� which shows a dog�s moving legs as a blur. 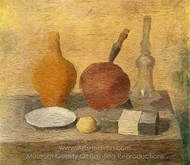 Some Futurist paintings were similar to those of cubism, with their sharp angles, different perspectives and flat colors; although many Futurist works have vibrant colors. 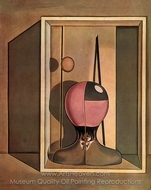 Futurism also had political undertones � the Italian government at the time was widely regarded as being corrupt and many Futurists were patriotic, hoping to establish the art movement as the official state art of Italy. 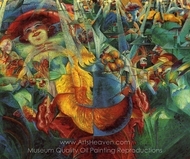 Unfortunately, this never happened � Italy�s leader Mussolini was not an art lover and Futurism was eventually condemned, despite Marinetti�s best efforts. The Futurists painted airplanes a lot, as they epitomized speed, power and movement; in fact during the 1930s and 40s, air travel, planes and associated technology became a staple of their work. A manifesto of 1929 introduced aeropainting as an officially recognized offshoot of Futurism and over 100 aero painters painted works varying from realistic landscapes to abstract studies. Many of these depicted in some way the sensation of flying, or the images that could be seen from a plane. 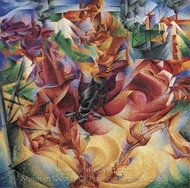 Outside Italy, Futurism became popular elsewhere in Europe, particularly in Russia, where the movement flourished briefly until the revolution in 1917. 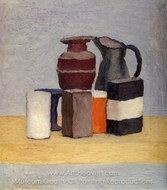 Russian Futurist artists included Khlebnikov, Larionov and Malevich; like their Italian counterparts, the Russian painters were influenced by Cubism � in fact, the Russian branch of the movement is sometimes known as Cubo-Futurism. One of the biggest influences of Russian Futurism was on the country�s striking propaganda posters of the 1920s, depicting workers and soldiers and still instantly recognizable today. Futurism as a movement is considered to have died out in 1944, with the death of its founder Marinetti, although it influenced Surrealism, Dada and even Art Deco. The elements of Futurism are still apparent today, especially in music videos and advertising, with their emphasis on constant movement, energy and action.